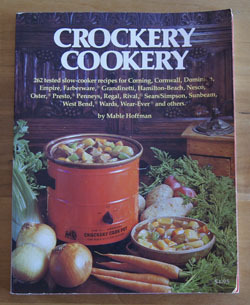 Cookbook #136: Crockery Cookery, Mable Hoffman, H. P. Books, Tucson, AZ, 1975. Mable Hoffman published 18 cookbooks over 25 years. She was one of the first to publish recipes specifically for slow-cookers. This 2010 article, Mable Hoffman dies at 88; slow-cooker pioneer wrote ‘Crockery Cookery’, tells us about her life and writing. I like Crockery Cookery. Lots of good-sounding recipes with ingredients I usually keep on hand. The first chapters cover the use and care of slow cookers and measurement conversion charts, and a chapter titled “Consumer’s Guide) is of historical interest – it decribes the crockpots available in 1975. There is a temperature chart with details on how these recipes work with each type of pot. The soups and stews chapters are the ones I would use most often, but I noted the snack mix recipes (like chex mix) in the appetizers chapter as well. 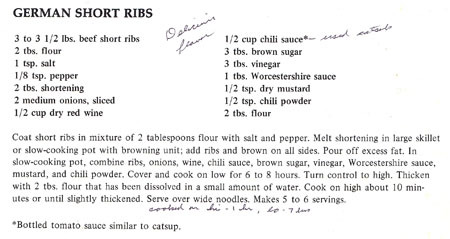 Of course, the recipes are 4 decades old, but that doesn’t mean they aren’t tasty. Short ribs are available bone-in or boneless. They are usually cut into individual ribs, like country-style pork spareribs. Short ribs are a flavorful but less-tender cut of meat: perfect for a slow cooker. I went to the butcher at Whole Foods and found short ribs that were in long chunks, both bone-in and boneless. The bone-in ones were very fatty and the boneless ones very lean. I got one bone-in rib for the flavor, and then four boneless ribs for the lower calories. Then I cooked them as in the above recipe, using my mother’s advice to cook for 1 hour on high and 7 hours on low. Salt and pepper the short ribs and dredge in the 2 tablespoons flour. Brown on all sides in hot oil (I used groovy lard). I did this browning step in a pan on the stove; if your slow-cooker has a browning setting, you can do it in the cooker itself. Remove the meat from the fat (drain it if you brown it in the cooker). Combine the onions, wine, chili sauce, brown sugar, vinegar, Worcestershire sauce, mustard, and chili powder in the slow cooker. Add the meat and mix. Cover and cook on low for 6-8 hours. Remove the meat from the cooker. Mix the final 2 tablespoons flour in a small amount of water and stir it into the sauce in the slow cooker. 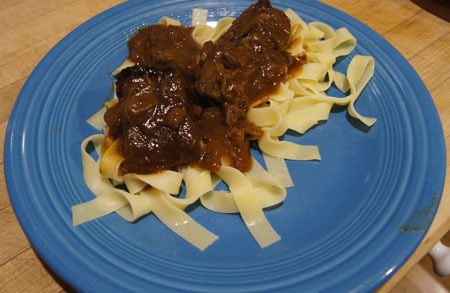 Turn the slow cooker to high and cook about 10 minutes, or until slightly thickened. “Delicious flavor” just like my mother noted! The ingredient mixture was perfect. And it smelled really good cooking! I cooked them an hour on high and 7 hours on low. But next time, I will cook them 6-8 hours on low. I think my crockpot cooks a bit higher on low than crockpots from the 1970s; anyway, I felt mine were a little overdone. The meat was broken down almost like a shredded beef dish. No complaints from my dining partner, though! I will make these again. Note: We had leftovers so I froze the meat and gravy. A couple weeks later, I heated it up and added potatoes and carrots and served it like stew. This meat really has great flavor. Note: These are the crockpot cookbooks that I have covered so far.